After all the excesses from the last fattening recipe, it is time to go for moderation a bit. 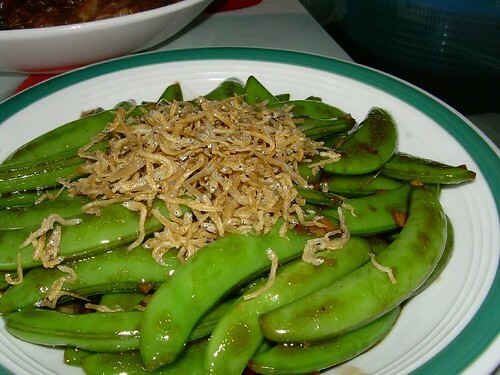 Hence, this recipe of Sugar Snap Peas with Tiny Anchovies. And these tiny anchovies are probably the smallest fish that is served on people’s plates. For hokkiens, we call them “ghun he”. I don’t know what they are called in English…suffice to say, they only measure on the average 10 – 15mm long. So, this recipe calls for sugar snap peas and tiny anchovies plus the compulsory garlic and oil. Seasoning? Just oyster sauce will do. Simple, isn’t it? That’s what I like about this dish. The sugar snap peas are sweet (why else use the word sugar?) and the tiny anchovies lend a hint of saltiness to it. To prepare the sugar snap peas, you must remove strings which run across the pod. To do this, pinch the very tip of the pea, getting hold of the string. Pull the string up the straightest side toward the stem end; pinch off the stem end and continue pulling the string until there is no more. Heat oil in wok. Add tiny anchovies and reduce heat to medium. Fry the anchovies till golden brown. Remove anchovies and set aside to cool. With remaining oil in wok, add garlic and fry till aromatic. Increase heat to high and add sugar snap peas. Stir fry continually for 2 to 3 minutes whilst adding oyster sauce. Sprinkle some warm water occasionally to prevent drying up. Serve on plate and sprinkle fried anchovies on top of the sugar snap peas. this is also known as snow peas rite? earl_ku : No, these ones are fat whereas the snow peas are rather pathetic looking. See this link for snow peas. OMG, i found another good food blog. This will definately go to my bookmark. can get ideas what to cook over the weekend 🙂 Thanks! That’s a heap of anchovies! So this dish has a good blend of both savory (anchovies) and sweet (sugar peas)! No need seasoning liow…just you said, some garlic and oil will do. When I was home, I was out searching for tiny shrimp (geragau – used in cincaluk) but it looks like they have disappeared from the market in Penang. Lucky tiny anchovies are still around. I think the “ghun he” is called “nanata” or white bait, though they both have sub species as well. Whatever it is called, is is VERY nice. RasaMalaysia : Maybe you should have tried Melaka. I think they still have a lot of these cincaluk shrimps. Ian Teh : Hi Ian! These fellas are very much smaller than the white baits. This looks really yummy! I’m from the USA and I’m wondering if the tiny anchovies you’re using are fresh or do you by them dry? I think they sell these at the Asian markets here but in the dry form. Please let me know. I’m dying to try this recipe! THANKS!! Peach : Yes, they come in dried form. Happy Trying!